To the northwest of Chiang Mai and nestled along the border with Myanmar, the mountainous and largely forested province of Mae Hong Son offers plenty of scenic natural beauty and outdoor activities to go with it, a captivating rural charm blended with a refreshing laidback vibe, and the fascinating culture of its ethnically diverse people. While Mae Hong Son can of course be visited year-round, the best time to visit is during the cooler months of November to January. Many people will visit Mae Hong Son from Chiang Mai, on an excursion of a couple of days or longer. 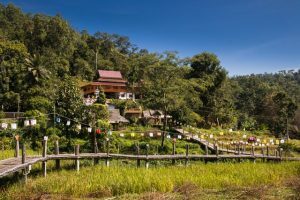 While daily flights and bus services are available from Chiang Mai, a popular option is to travel the Mae Hong Son Loop tour route by rented car or motorbike. The Mae Hong Son Loop is a journey of some 600 kilometres that starts and finishes in Chiang Mai, and it can be taken in a clockwise or counter-clockwise direction. The Loop can be done in three or four days. It passes through picturesque countryside, taking in places like Mae Chaem on Thailand’s highest mountain Doi Inthanon, the riverside town of Mae Sariang, the market town of Khun Yuam and the popular town of Pai along the way. In earlier days a sleepy and somewhat remote Shan town, Pai lies on the banks of the Pai River and is today known for its fun and chilled-out new-age scene, often being compared somewhat to Bangkok’s backpack mecca of Khao San Road. There are guesthouses and fancier hotels, restaurants, cafes, handicraft shops, bars and a choice of activities on offer like rafting, tubing, trekking and cycling as well as hot springs to enjoy. Among local sights to visit around Pai is the Memorial Bridge across the Pai River which was built by the Japanese during World War II and is a ‘must-see’ photo op for mostly Thai visitors. This is located about nine kilometres from town and is near Pai Canyon, another attraction and an area of eroded red sandstone with gullies and ochre-coloured ridges dotted with pines. As well as the main viewing area, side trails lead off into the Canyon and surrounding woodlands which can be good for birdwatching. About five kilometres from town is Ban Santichon, offering a traditional Chinese village experience complete with clay houses, eateries serving Yunnan cuisine like pork hocks with buns and steamed black chicken with Chinese herbs, Chinese tea tasting, pony riding and the chance to dress up in traditional Yunnan attire. For early risers, the nearby Yun Lai Viewpoint is a spot from which to watch the sun rise. A sight in Pai that is not so well known to tourists but is worth the visit is the bamboo bridge, namely Kho Ku So, which translates into the Bridge of Merit. Around eight kilometres out of town, this bamboo bridge pathway stretches for over 800 metres across rice fields and leads to the bamboo temple. It was built by locals for the monks who previously had to walk for some six kilometres to the village to get food. On the section of the Mae Hong Soon Loop between Pai and Mae Hong Son town, Tham Lot makes for an interesting side visit. About 10 kilometres off the route, this is a huge cave system once inhabited by prehistoric man and where ancient clay pottery and carved wooden coffins have been found. 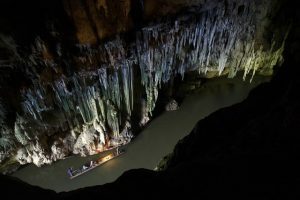 The Tourism Authority of Thailand’s ‘Cruising through the Cave’ picture of Tham Lot won a 2018 PATA Gold Award in the Travel Journalism – Travel Photograph category. If bamboo bridges happen to be your thing, there is another one to see between Pai and Mae Hong Son town. This one being the picturesque Su Tong Pae, the Bamboo Bridge of Faith and Success in the village of Kung Mai Sak, some 13 kilometres north of the city. This 500-metre-long bridge crosses the Sa-Nga Stream and a rice field to link the village and a hillside temple thus allowing the monks to go out for morning alms. 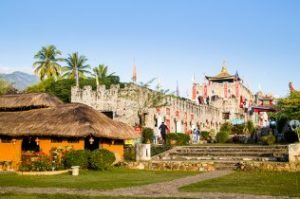 While in the area, the border village of Ban Rak Thai (literally meaning ‘the love Thailand village’) can be visited as well. The village was settled by former Kuo Min Tang fighters from Yunnan province in China, after the communist takeover of that country, and there is Yunnanese Chinese food to enjoy as well as Chinese tea shops, as well as the enchanting scenery of the surrounding valley and hills. Nearby is the Pang Ung, Pang Tong Royal Development Project where the picturesque scenery has earned the area the nickname of the ‘Switzerland of Thailand’. Pang Ung used to be an illegal opium planting area until an initiative of the late King Bhumibol Adulyadej saw the area, and its people transformed into a place that now grows various types of produce like avocado, persimmon, Chinese pear and Chinese bayberry. 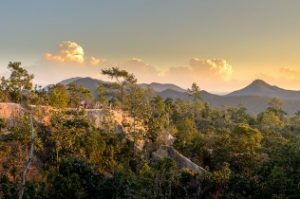 Just outside of Mae Hong Son town is Wat Phrathat Doi Kong Mu, a hilltop temple affording panoramic views of the city and surrounding countryside, while in town itself is Wat Chong Kham, which has appeared in advertising campaigns for the province. Wat Chong Kham is close to the location of the nightly Mae Hong Son Walking Street market that operates from October to February and which is worth exploring for some great local food and locally-inspired gifts to take back home. For those visiting in November and early December, the Bua Tong Blossom Festival in Mae Hong Son’s Khun Yuam district is a chance to see the mesmerising sight of the area’s hills and valleys blaze into bright gold as the Dok Bua Tong or wild sunflower is in its blooming season. Held alongside the Festival is a local market selling local arts and crafts and farm fresh produce. Alongside the nationwide festivals; such as, Songkran and Loi Krathong celebrated in Thailand, local festivals and traditions reflecting the peoples’ beliefs and customs are also celebrated in Mae Hong Son. These include the Chong Phara tradition of making merit in the Shan style at the end of Buddhist Lent or Ok Phansa in October and the Poi Sang Long novice ordination tradition during March or April. While the Mae Hong Son Loop can be done in three or four days, various side trips can be added to spend as much time as desired meandering through the region. Some suggested places include Huai Nam Dang National Park near Pai, where in the early morning during the winter months a mystical-looking sea of mist can be observed from the viewpoint at Doi Kiew Lom. 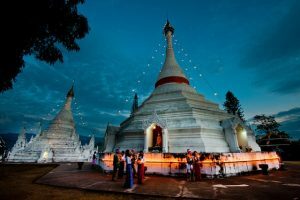 At Doi Inthanon, the Great Holy Relics Pagodas of Phramahathat Napamathanidol and Phramahathat Napaphol Bhumisiri can be visited to pay homage, while the Doi Inthanon Royal Project research station with its flower garden and nursery makes for a great lunch stop. Mae Hong Son is one of the 55 secondary destinations the Tourism Authority of Thailand (TAT) is promoting through the “Amazing Thailand Go Local” campaign, the aim being to spread more tourism revenue into rural areas and grow community tourism in a responsible and sustainable manner, while also evening out seasonality and weekend/weekday travel flows.